This website is dedicated to the diverse and fascinating ant fauna of Cachoeira Nature Reserve (Paraná, Brazil). My goal is to encourage the study of ants and provide taxonomic information that will facilitate the identification of ants and their use in inventory and monitoring programs. Ants + Web 2.0 = Ants 2.0. The internet is undergoing a major change - from an original environment in which individuals post static information to a new environment where global information is available to local contexts and giving people the flexibility to find, organize, share and create information in a locally meaningful fashion that is globally accessible. This shift has been described as the switch from Web 1.0 to Web 2.0. In the biological sciences, the primary mechanisms for sharing work have traditionally been monographs, journal publications and personal communications via conferences. This is generally a slow and static process. Also, there is a divide between those who have access to the information to carry out research and those who do not. Developments associated with Web 2.0 are closing this divide. With projects like AntBase and AntWeb, which bring together the information on ~12.000 ant species, myrmecology is playing a leader role in the transition from Science 1.0 to Science 2.0. Here is my contribution to Ants 2.0. The basic unit on this site is a genus web page. For each genus I provide a list of all species with high quality color images, taxonomic notes and remarks on their natural history. If available, I will also link to information about a particular species or genus in other places on the web and/or the literature. The content will be sparse for a while as content is added genus by genus. Highlighted genera in the species list link to already completed genera accounts. This site is a never ending work in progress and will be updated on a regular basis as information changes. Future plans include a Portuguese version of the site and provision of interactive, multiple access keys to all ant species of the reserve and the Southern Atlantic Rainforest of Brazil. If you have any comments or contributions, please contact me. All species listed here are a product of my research as part of the SOLOBIOMA project. I mainly collected ants from leaf litter and soil samples using Winkler bags and Berlese funnels. 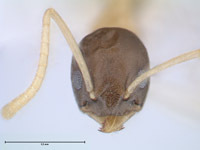 Therefore, the current species list largely excludes arboricol ants. Hopefully, I will close this gap in the near future.